OK, so I was going to put this table together, but WMPU beat me to it, so consider this a link of interest, with some commentary. 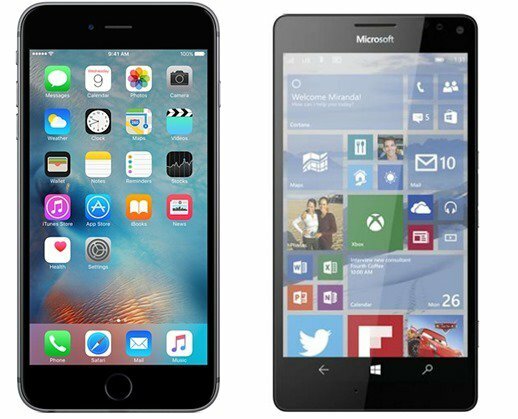 The iPhone 6s Plus, announced yesterday, has the tech news wires buzzing - but look how similar in ambitions it is in many ways to what Microsoft's expected to announce in a few weeks time - the rumoured Lumia 950 XL. Is there any point in trying to pick a 'winner'? You can see the WMPU feature here. In fact, several of the blanks in the original table have now been filled in by the community - the iPhone 6s Plus has 2GB of RAM and a battery capacity of just less than 3000mAh. Of course, there's far more to the smartphone experience that raw specs. The 950 XL and iPhone 6s Plus have very different interfaces and ambitions - Windows 10 Mobile on the former is much more about a 'serious' interface, mirroring Windows 10 on the desktop and providing continuity (even Continuum - see what I did there?! ), while iOS 9 with all the Force 3D Touch enhancements, plus the resurrection of Nokia's old 'Living Images' idea, are geared slightly more to consumers, media and fun. It's a subtle distinction, I'll admit, so I'll come back to this in a feature in the future, to flesh it all out!